The Tower represents change in the most radical and momentous sense. It is for this reason that the card itself visually looks so unnerving. But it doesn't necessarily have to be truly frightening or ominous. Because at the heart of this card, its message is foundational, groundbreaking change. The kind of event that the Tower card marks does not have to be something terrible, like a disaster or a great loss. Change itself is a normal part of life that one has to embrace. But it can sometimes strike fear, for it means that we must abandon the truths that we have known prior to this event. The old ways are no longer useful, and you must find another set of beliefs, values and processes to take their place. The old ways are no longer useful, and you must find another set of beliefs, values and processes to take their place. Be positive, it is time for you to replace the old foundations of the past with something that is more genuine and will serve you better in what is to come. In terms of work, there is an inevitable argument bound to happen. You need to be in control and keep your temper in check. Avoid saying something that may hurt other people. When it comes to your love life, your romantic relationship may be nearing its end. Take this as a warning - if you really value your relationship, then it is time for you to take damage control or open a communication to clear misunderstandings. In your finances, the tower meaning refers to the need to be assured on your transactions. 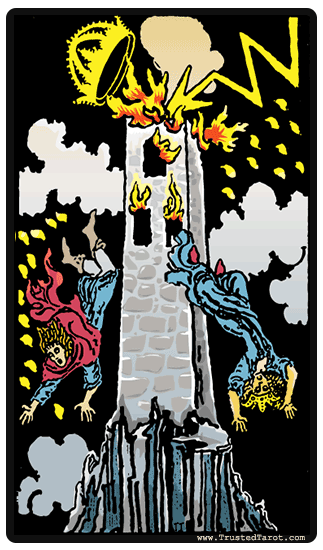 When you get the Tower card reversed, you can feel some crisis looming along the horizon, and you are struggling as much as you can to try and avoid its manifestation. What you have not realized is that these breakdowns can be beneficial in breaking down your reliance on something that is false. The tower is built on faulty foundations, and it must fall. Though the destruction will be painful, the humbleness resulting from it can bring us peace. What you relied on will no longer be there for you. Do not take this as a drastic and depressing change, it is time for you to become more self-reliant.